No loadfactors, profit margin or unit cost this time....but I would just like to share how proud I am of the increase in our KLM customer satisfaction! These last years we have worked hard together to increase the KLM customer satisfaction. We did this, amongst others, by investing in our product, focusing on frontline staff-customer interaction, digitization and improving our customer care when disruptions occur. TV screens hang in many locations in our company with information about the KLM customer satisfaction, shown via the NPS score. 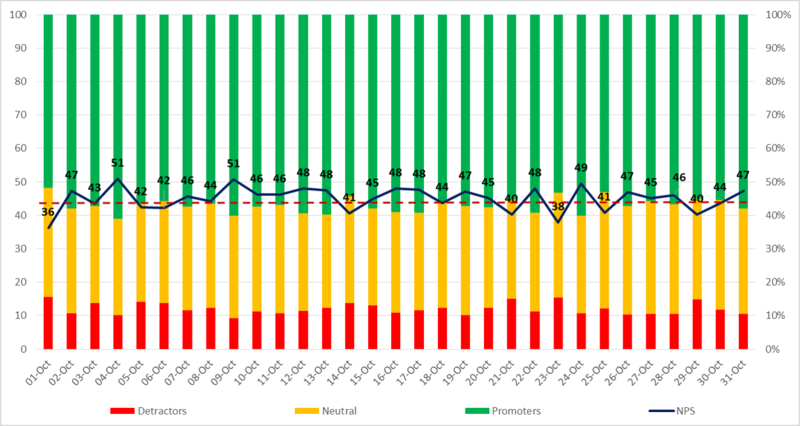 As a reminder for colleagues who are not involved with it every day: NPS stands for Net Promoter Score and shows the appreciation level of our clients. Calculation of the NPS is as follows: NPS = promotors (9-10 score) minus the detractors (the 6-score and fails). This is therefore a very important parameter. It gives an indication of the satisfaction level of our customers and therefore loyalty. The monitors show the score for a specific day (total, per cabin, per haul), the trend of the previous 12 months and the breakdown of the scores for KLM and KLC. I also take a quick look at the screens every day to see how we are doing. These last weeks we have had a lot of good scores, and earlier this week we received the October result... an NPS of 45! A result that we have never reached in one month since we began measuring in 2014. We can be very proud of ourselves. But measuring the NPS only, is obviously not enough. It is also important to know what the drivers are behind a certain score. I flew a few times again in recent weeks; not only to Paris but also to Shanghai and New York. On the flight from Shanghai, three Platinum For Life and twenty Platinum customers were on board, both in Business and Economy Class. It was a great opportunity for me to hear feedback about KLM from a number of them; what are we doing well and what can we do better. From their feedback it appeared that the following three drivers are crucial: 1) keeping the basics right, 2) good operational performance and 3) the proper staff interaction. All of them were full of praise for our KLM staff and at the same time indicating where we could still improve. This feedback, on what one finds important, is in my opinion completely in line with our KLM Compass. Each day we welcome 90,000 passengers and load 1,700 tons of cargo on board our aircraft on the way to their destinations. That is why we must ensure that we keep the basics right, that we work as a well-oiled machine and that our aircraft are ready to operate safely. But we facilitate more than just the journey. Through the care, attention and exceptional service from all KLM staff, we make the difference for our customers. Our frontline staff is supported by each and every department. With our KLM Compass, we take the special customer experience as a starting point for everything that we do. And so together we provide our customers with the true KLM experience. Friday afternoon I was at the 'Marketing Awards' of the North America (NAM) area in New York. Together with KLM- colleagues and two external marketing experts, I attended the Marketing Excellence presentations of the four NAM markets. I was extremely impressed by our brand campaigns in Canada, Mexico and the US. Each had their own creativity, strength, but above all tuned in to the local market dynamics and were thus ‘different’. Our KLM Compass was also noticeable in the campaigns, in some very explicit, in others more implicit. These 'Marketing Awards' took place over the whole world. It is wonderful to see how all AF-KL organisations, commercial and at the stations/airports, promote our strong KLM brand with the assistance of these types of campaigns, and the KLM Compass ensures the desired customer experience, locally as well. In addition to the interaction between our staff and the customer and KLM brand perception among customers, our product also plays a major role in the customer experience of course. Last Friday, the first B777 was delivered with GoGo WiFi installed. KLM Engineering and Maintenance and Fleet Services are now busy acquiring certification for the software. The first fully modified A330 with WiFi is expected to be deployed at the beginning of next year, and six of the 30 B777-300s will be ‘live’ at the end of 2019. Connectivity on board has become an industry standard. I am pleased that we can expect the first real time application on a KLM flight in early 2019. Next week I am travelling for one day to our AF-KL office in Johannesburg, South Africa. Africa is a continent where the complementarity of the strong KLM network in East Africa, the solid Air France network in West Africa and the joint networks in South Africa is very visible. A part of that strength of the AF-KL cooperation is to ensure that our customers can easily, comfortably and seamlessly travel via both hubs in our networks. I truly value how Air France and KLM colleagues everywhere in the world work together to ensure this every day. As I said in the beginning, I am proud. Proud of all KLM staff, on the ground, in the cabin, in the cockpit, who have again put the ‘customer spirit’ first these past months and have not only been committed to improving our customer satisfaction, but also keeping KLM fit and relevant.